If you are a busy type person who does not want to wait for your computer to show the status message of shutdown or log in and logoff, there is a Windows Group Policy tweak to disable them. Once you have disabled the shutdown, login or logoff message from the group policy, Windows will no longer show you the message which reminds users to wait while your computer shutdown or logoff. Let us see how to implement it on your PC. This Operating system trick is valid only on Windows 2000, 2003 and XP. 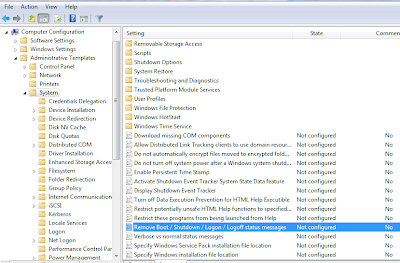 You can enable system status message at any time by reversing the Group Policy tweak made on your computer, and you will again see the shutdown status message while your computer is turning off. To remove the Windows shutdown and logoff status message from your laptop, follow the steps below. Select enable to stop Windows showing shutdown and logoff status message on your computer. Go to the Location Administrative Templates> System> Remove Boot/ Shutdown/ Logon/ Logoff status messages and select disable to enable shutdown and logoff status message. From Windows Group Policy Edit we can change the normal operation of most of the windows features. In case if you want to disable access to certain tools on Windows for other users, you can set policy in Group Policy Edit. Or if you want to stop displaying certain messages or alerts on your Windows computer as we have stopped Shutdown and logoff status alert here, you can do the same from Group Policy Edit. How to Check My Tata Photon Plus Internet Usage? To learn more about it click on the link below. How to Solve the Destination Net Unreachable Error? How to Disable or Enable USB Ports from Registry? Just like Group Policy Edit, another important Microsoft tool is Registry Editor. Registry Editor is also used to stop or manipulate the normal operation of Windows features. As you know, it is not recommended to play with this tool unless you know how to handle it. How to Change Default Size of Ping Echo Request? How to Set Continues Ping? Which is the Best Free LAN Messenger? Certain malware can disable the entry of the user to these tools. How to Setup Free Godaddy Email Account? How to Start WLAN AutoConfig (WLANSVC Service) On Windows 10? If you face such issues, follow the solution provided in the link below.